More than half of new born babies in China in 2017 are second child of their families, according to National Bureau of Statistics of China. 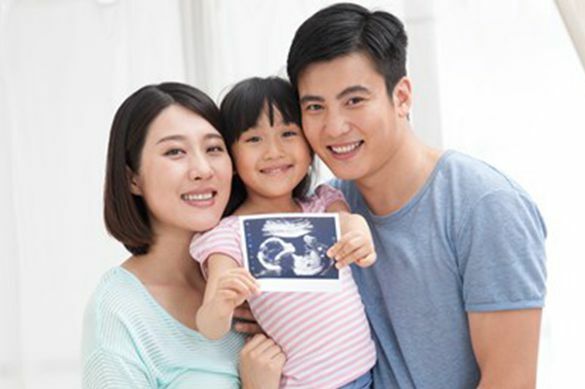 After China changed its family planning policy to encourage couples to have two children, the country has entered its “two-baby era”. The National Bureau of Statistics said in an article published on January 20 that second babies accounted for 51.2% of all new born babies in 2017, 11 percentage points higher than in 2016. The number of new “second babies” also jumped to 8.83 million in 2017, 1.62 million more than in a year ago. Partly thanks to the increase of second babies, the sales of parenting products are enjoying a healthy growth. 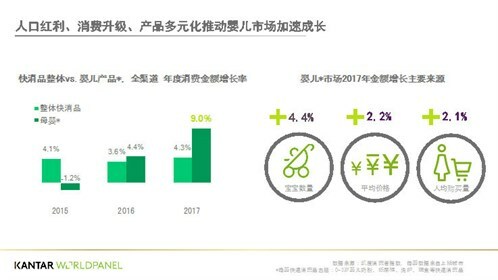 According to Kantar Worldpanel China, the total sales growth of fast-moving consumer goods is 4.3% -- that was outpaced by parenting goods, which grew by 9%. The contributing factors of the growth include increase of babies (+4.4%), higher average price (+2.2%) and growth of number of items in each basket (+2.1%). Kantar Worldpanel data also showed that nearly 70% of parenting goods buyers are omni-channel shoppers. Among all channels, specialized mum and baby shop had a penetration of 52%, which means for every 100 families with babies, 52 of them are buying from mum and baby shops. From the survey, 81% of two-baby mothers are time poor. Being modern mothers, they agree the best thing they can give their children is to spend time together. As a result, they have very strong purchasing intention to buy machines/home appliances/robots that can help them save time, such as floor cleaning robot, window cleaning robot, electric breast pump, egg cooker, and mini rice cooker. “Machine for time” is a very important principle for two-baby mothers’ shopping. For mum and baby shops, they can open “time-saving machine” corners to demonstrate how these products can save time in real life scenarios. These items can significantly enhance average shopper spending. * They like to buy and sell second-hand products: 66% of surveyed mothers said they wish there is a specialized second-hand baby product trading platform. They will be less hesitant to buy high-value durable goods if there is a solution to sell them on to other mothers. * Establish partnership with second-hand good trading platforms to increase the ROI and total usage of durable parenting goods. Two-baby mothers are often “without” hands during shopping because they need to hold both kids. However, in offline shopping, it is essential for consumers to touch products to increase sales. To cater to this need, mum and baby shops should set up a kid play zone to let children play or watch videos, so their mothers can spend more time to feel the goods. But these zones need to be open to ensure mothers can always keep their kids insights. Delivery service is another opportunity: in our survey, no delivery is the second most mentioned factor that mothers don’t like about mum and baby shops. Our survey has found that 44% of mothers felt more stressful after their second babies were born; 63% of mothers wish they can join a community to share parenting tips; 66% of mothers said the major information source for shopping decision is recommendations from friends. This suggests mum and baby shops should establish online communities to recruit mothers as members. It will effectively build stronger bonds between shops and their customers. The shops could also foster key opinion leaders in these communities. If done well, the shops will become an offline community centre that mothers would naturally visit frequently. The “balancing attention” trend means mum and baby shops should consider expand their product line/categories. From our survey, 69% of second babies are between 0 and 2 years old, while 71% of first babies are between 3 and 6. The shops should expand the products/categories from only 0 – 2 to 0 – 6.